Friday March 18 and today Phil and I walked to Saint-Servan. 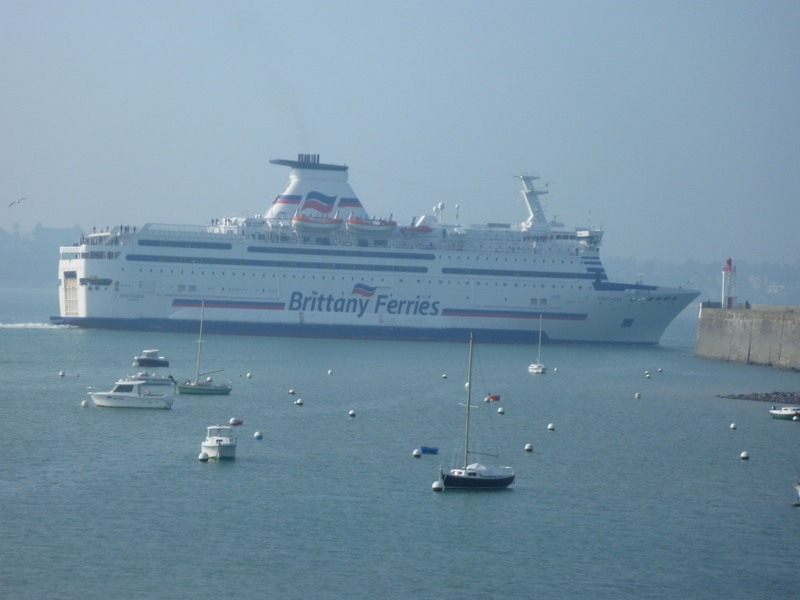 Saint-Servan is a district in Saint-Malo which is across the bridge and up a hill. It was cool, about 40F but little wind. The forecast is for windy days this weekend with gusts up to 65 kph or 40 mph. We stopped at the Au Panier d’Italie a shop selling take out Italian delicacies. 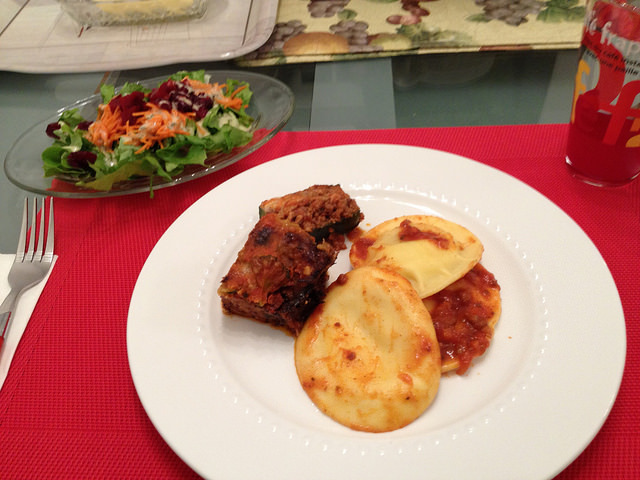 We purchased gratin de legumes, courgette farcies and cheese ravioli. Dinner. Our next stop was the market which is twice weekly in Saint-Servan, Tuesday and Friday. We wandered around the exterior stalls and looked at kitchen gadgets, clothing, and flowers. We walked inside to get in line at the butcher’s shop. The proprietor we knew from 2013 and 2014 was back at work. He remembered us. His assistant greeted Sandy in English. 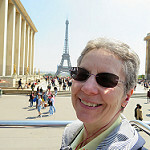 Sandy greeted the assistant in French. Sandy and the assistant then practiced reading the price of the purchase in each others language. We stopped at a vegetable (legume) stall to purchase Batavia lettuce. We wandered around a bit more then walked home. 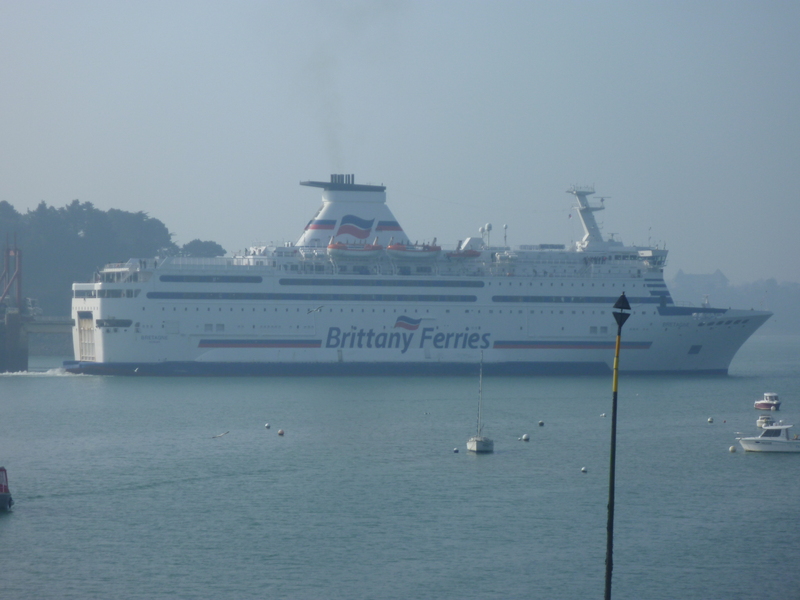 As we crossed the bridge over the lock (la écluse) we noticed that the Brittany Ferry was getting ready to depart at it’s usual 10:30 am schedule. We hurried to the harbor to watch it leave. It looks huge! All of the vehicles and passengers will be docking in the U.K.around 18:30 tonight. 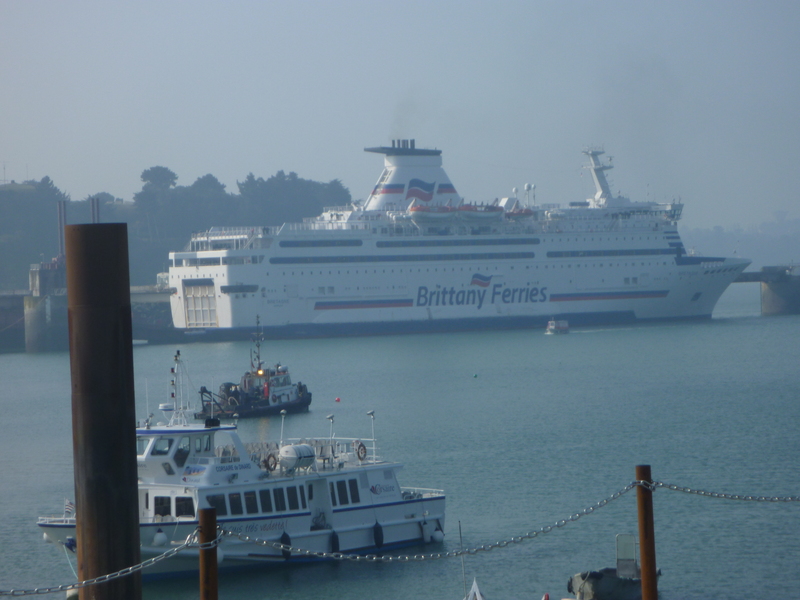 The Brittany Ferry at dock, starting to leave and passing the breakwater (mole) lighthouse. 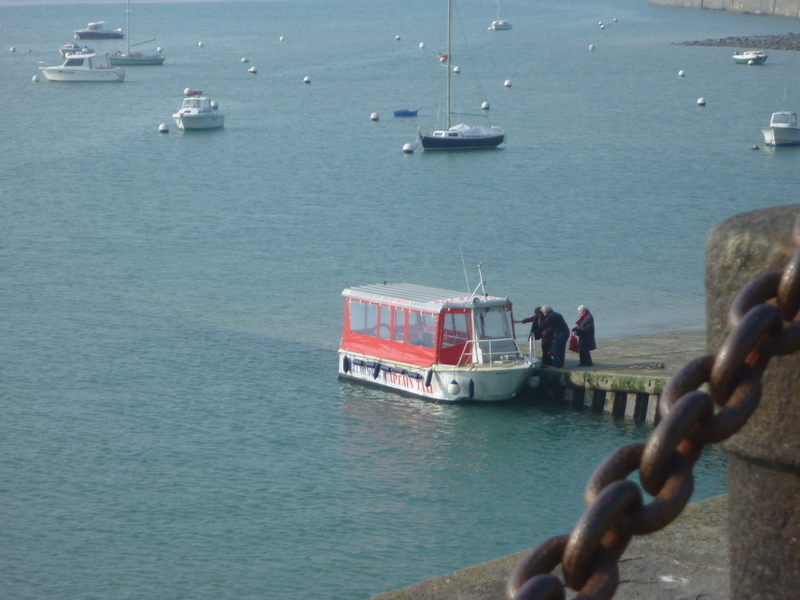 We also saw the “Captain Taxi” which is a water taxi which operates in the harbor between Saint-Malo and Dinard. 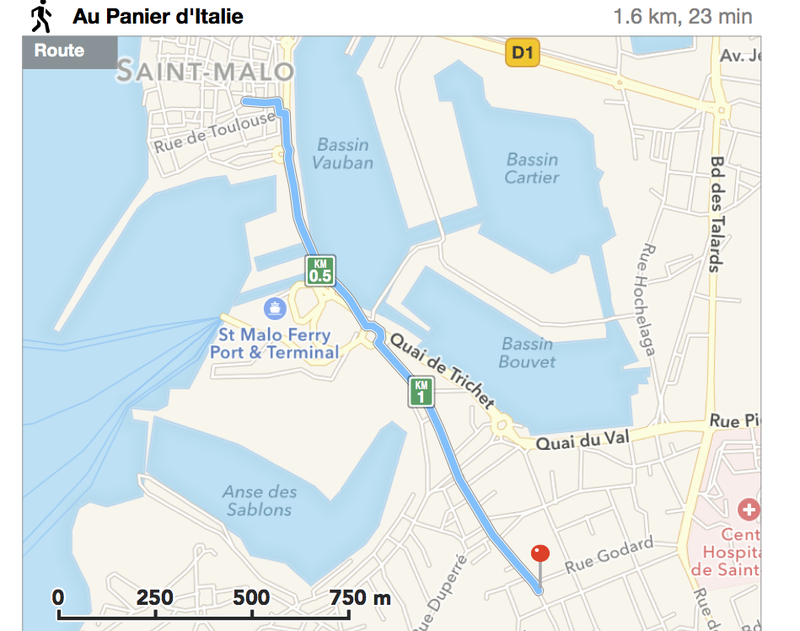 The walk to Saint-Servan is 1.6 kilometers (km). About 2 miles for the round trip. Sandy has been starting to wash some of the windows this week. She and the gulls are having a disagreement. She thinks the window sills should stay clean and the gulls disagree. For dinner we cooked the Italian food we had purchased in the morning. All our pictures for March in Saint-Malo France can be viewed at 2016-03 March in Saint-Malo on Flickr.